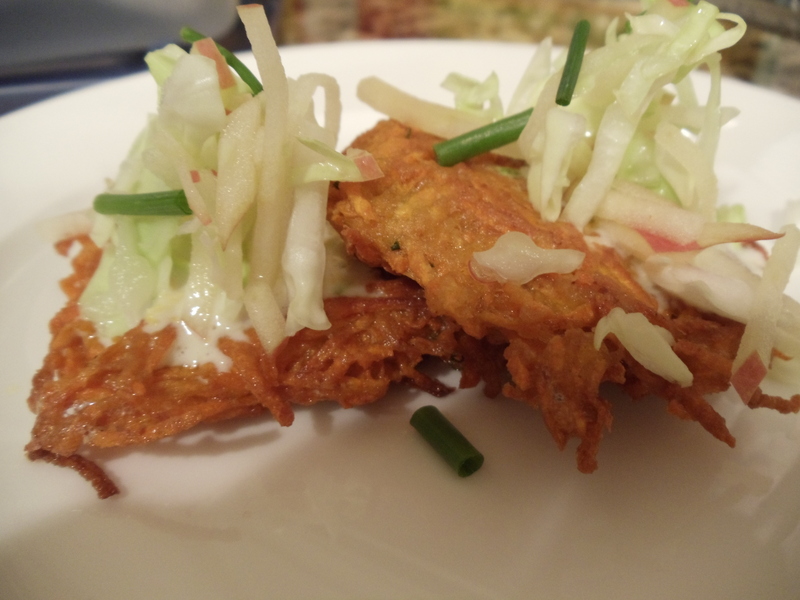 We did this crunchy little sweet potato cake with a crispy cabbage and Fuji apple slaw at a cooking party, and it was the first thing to disappear. Unfortunately, this photo doesn’t clearly show that it was as pretty as it was tasty. Imagine this: a chewy, sweet and salty bite of latke topped with a pungent, floral, creamy salad that has a zip of citrus and tang of creme fraiche, all in one hot and cool bite. Using a grating blade in a food processor, or a box grater, grate the sweet potatoes, and place in a bowl covered with cold water. Drain water, then put the grated sweet potato into a lint-free towel and wring until the sweet potatoes are very dry. Put in a large bowl and add 2 eggs and 1 tablespoon of flour. Mix together and check for consistency, the mixture should be moist and “gluey.” If it isn’t damp, add another egg, if it isn’t “gluey” add another tablespoon of flour. Season generously with salt and pepper. Pour about a cup of grapeseed oil into a skillet, and heat until a small portion of the sweet potato place in the oil begins to sizzle. Form the sweet potato mixture into a ping-pong sized ball in your hand, then flatten into a pancake. Slide the cake into the oil and cook until golden brown on one side, about 3 minutes, then flip to the other side and cook until golden brown. Finish and cook this first pancake before you add more, then taste it for seasoning and consistency. If it falls apart in the pan, add another egg and another tablespoon of flour. If it is bland, add more salt and pepper. Once you have adjusted the mixture, continue to cook a few at a time, without crowding the pan. Remove the cakes to a paper towel-lined baking sheet, and place in a 250 degree oven to hold warm. Season with a sprinkle of salt. Mix the creme friache with the citrus zest and juice, and place a small dollop on top of each cake. Mix the cabbage and apples with a bit of olive oil, salt and pepper, then place about 2 teaspoons on top of the sweet potato cake. Garnish with chives and eat right away.